Okay, I am going to say right now, I may never have to buy store-bought ice cream again. Over the summer I made Blackberry Blender Ice Cream which was great, but it was more like a sorbet. 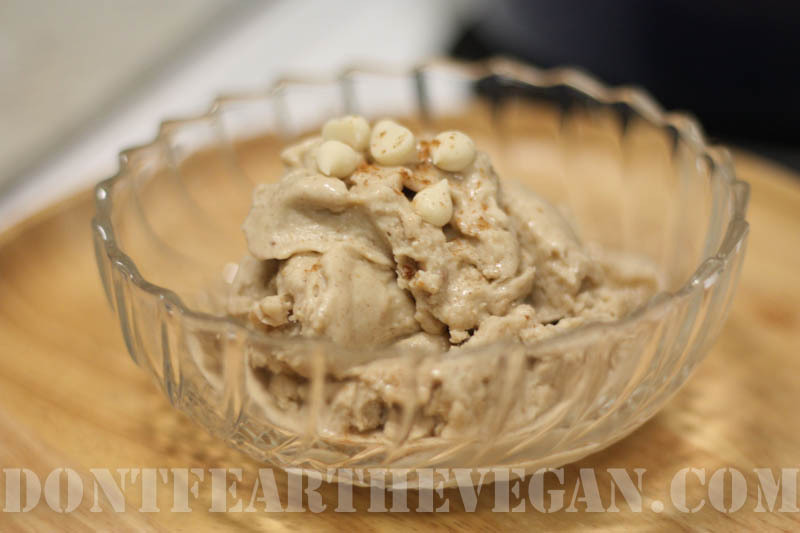 With this attempt and the addition of the cashews the result had a richness of a decadent ice cream. I have to admit that this came to be completely by mistake. I was making a filling for a phyllo dough dessert that was a fail, due to my inability to master the art of phyllo. The combination of the filling tasting really good and not wanting to waste it I decided I would attempt to make ice cream out of it. I threw in some soy nog because I like how it taste with chai. The best part about this is that you can make it in the matter of a couple of hours. Throw all ingredients into a blender and blend until creamy. Pour into a freezable, airtight container and freeze until solid. Once frozen set out to defrost until it will pop out of the container. Mine took ten minutes. Blend on high for 1 to 2 minutes. Serve with a little cinnamon and white chocolate chips on top.